Well, kinda. It’s not on some cutting-edge console, doesn’t have 4KHD3DXYZ graphics, nor even some epic score, but it does have really simple controls. That’s a plus, right? As its namesake suggests, HabitPRG takes your daily habits and makes an RPG out of them. 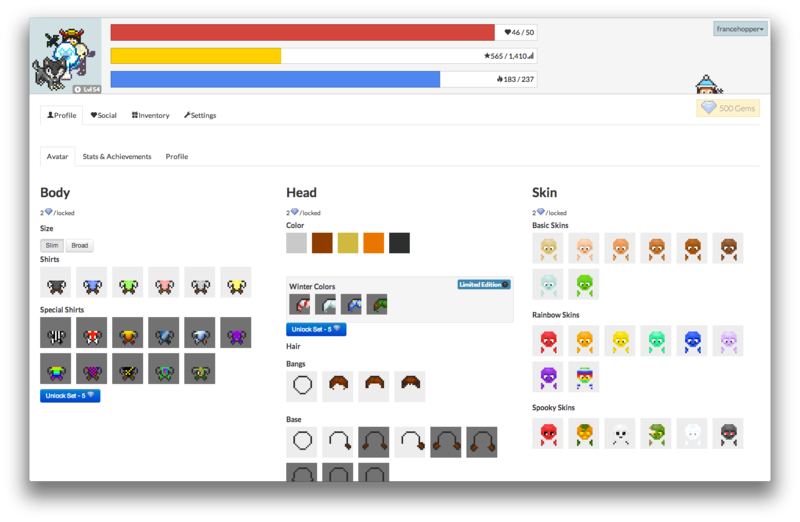 HabitRPG had a Kickstarter campaign that was successfully funded and offered some epic rewards for those with deeper pockets, including an item designed to your specifications and the chance to be one of the NPCs. 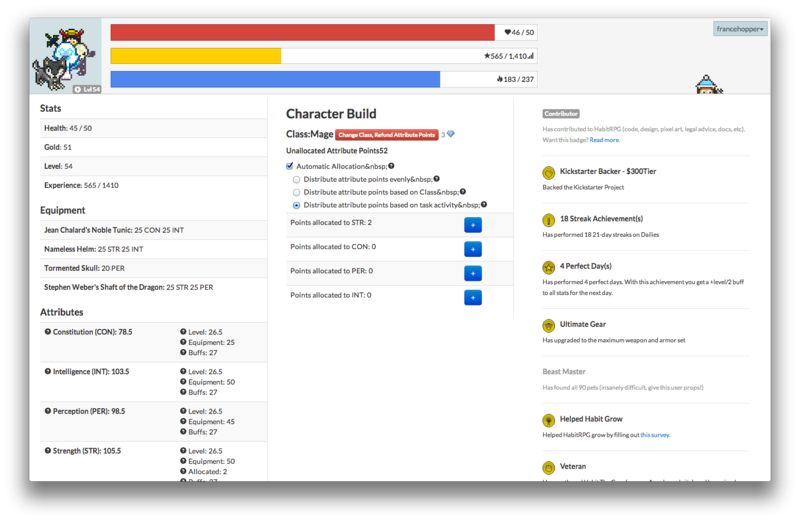 Recently, HabitRPG kicked the RPG element into full gear with the introduction of Quests and Classes. 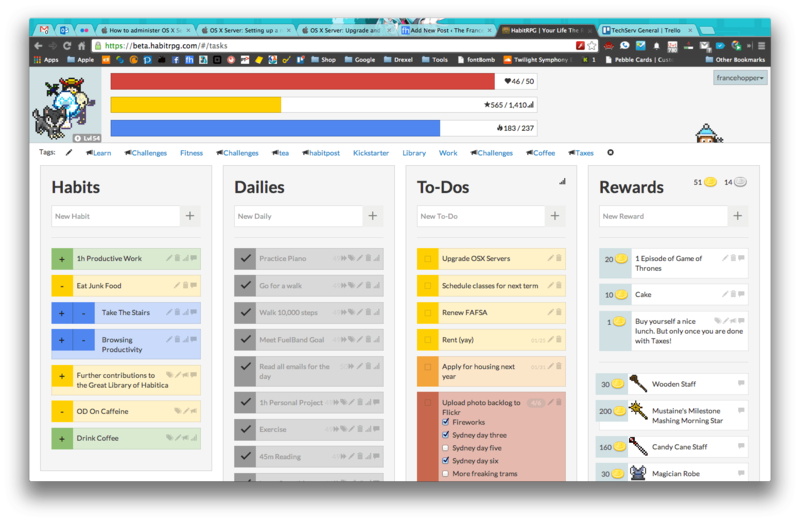 The first iteration of HabitRPG was, in a nutshell, a habit tracker where you “died” if you didn’t keep up good habits. Now it’s a bit more complicated. I’ll be honest, even I don’t fully know how it works anymore. But, if you have a number of mates on it, or find a group of people in the Tavern (chat) to team up with, you can now form a Party, which you’ll need to form anyway to complete Quests (you can make an empty Party for solo questing). 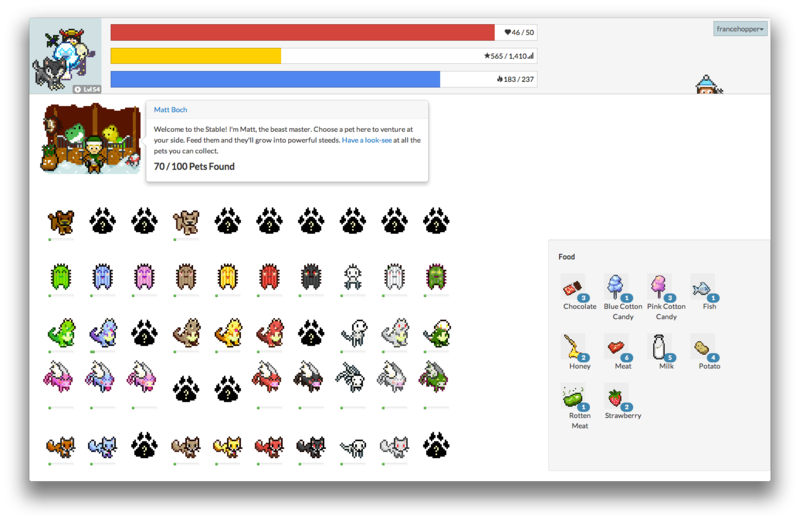 If you just want a habit tracker, HabitRPG still does that well. When you log in to Habit, you’re greeted with a simple, four-column display. Habits are, well, your Habits. Doing a good Habit rewards you with Gold to spend on rewards and some XP (Experience Points). Bad habits cost you health. Dailies are task to do daily, like take a walk, take out the rubbish, etc. Uncompleted Dailies cost you health the next day. Completed Dailies reward you with Gold, Silver, XP, and occasionally a Drop. A Drop can be an egg for a pet, a hatching potion, or food to turn a pet into a Mount (oh yeah, there’s that now too). To-Dos are things to get done. They can now be expanded into a checklist of things and have due dates, with To-Dos past the due date to soon cost you health for every day late. Rewards are things to spend your money on. Higher gear rewards greater XP gain, less HP loss, and other stats now too (yep, even Gear is complicated now.) Aside from Gear, you can spend coins on other rewards, like cake. 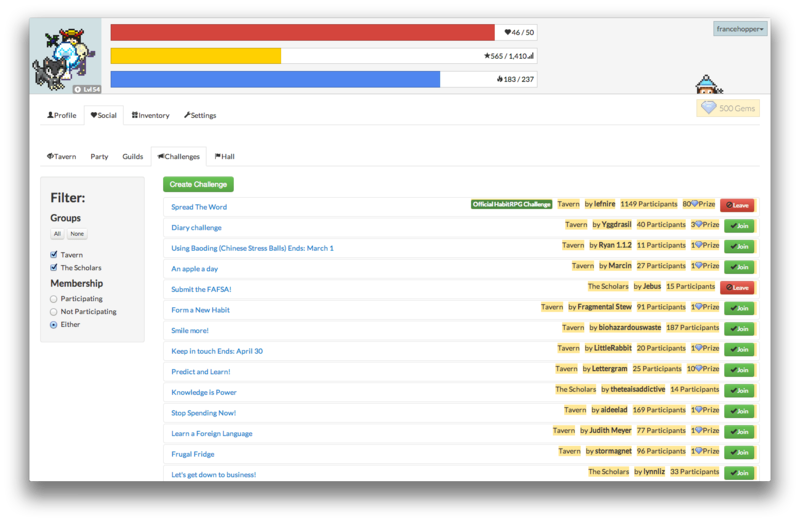 If you want to get more advanced, Habits, Dailies, and To-Dos can be tagged (very useful when you have a lot of any of the three), and configured with a difficulty level and attribute. By default, any new Habit, Daily, or To-Do is set to Easy difficulty with an attribute of Physical. Adjusting those settings will adjust your rewards for completion and penalties for failure. As you may have noticed earlier, Habit is one trippy rainbow of color. But what does it mean? With the exception of blue (kinda), the colors make a lot of sense. Anything newly added is colored yellow. The longer it sits, the more it turns to red and the greater the reward when completed. The better you do, the more it turns to green before changing to blue and the less generous the reward. Head spinning yet? Well guess what, there’s still a lot more to cover. Clicking your avatar reveals a whole new world of menus (actually tabs) to click through. If you’re one for customization, Habit now has plenty to offer. However, it is worth noting that unlocking additional customization options are paid for with Gems, which you have to spend actual money on. Hey, everyone has server bills to pay after all. The Stats and Achievements tab opens up a word of numbers. If you really want to get into the game aspect, this is a tab to carefully plan out. Attribute distribution is something you’ll want to spend time reading about. It’s rather detailed, so I’ll spare you from that on here. The Profile tab is simply an About Me tab. 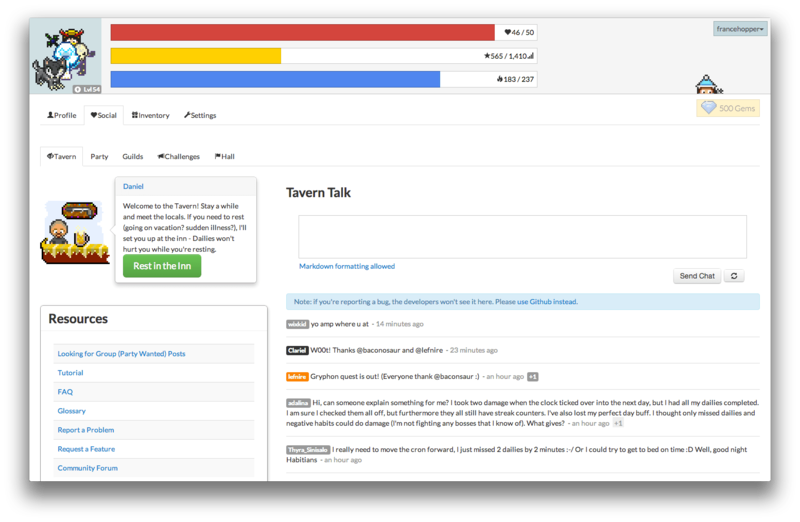 The Social tab brings you into the noisy Tavern, where you can chat with other players. You can escape the noise of the Tavern via Party (unless your Party is a noisy one). Party is where you can view your progress on a Quest currently in progress. If you also actually have a Party, it’s where you can manage it (saw that coming I bet). Guilds? No idea what those do nor how they’re different from a Party. The Wiki likely has that bit explained. I think they’re like the Tavern and it looks like you can join more than one. Collecting all the Pets (and now Mounts) is easily the hardest part of the game element of Habit. Right now anyway. Collecting them all unlocks an Achievement. You can equip one Mount and one Pet to your avatar at a time (psst, this is the part where you show off). There are also 100 Mounts to find. For those that stick around on Habit and contribute to improving it (write documentation, be a pixel artist, fix code, etc), there are also Rare Pets and Rare Mounts to be hand. Wrapping up Inventory is Equipment. Some are Drops from Quests, some are bought as Rewards, and some are exclusive to contributors. 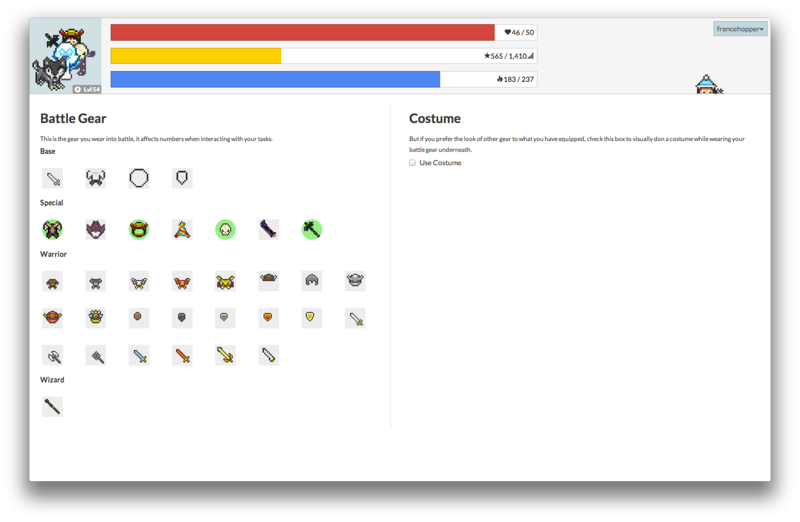 Thanks to the Class system, there is now a ton of Equipment to collect as well. Collecting the “Ultimate” Gear will award you an Achievement. Higher level Gear rewards you with higher XP gain and less HP loss. By the way, your HP can never be upgraded. It’s always 50, even as you level up. The final tab is Settings, which is for the adventurous (read: those that know what the F they’re doing). From settings, you can change (read: attempt to) the time your day starts, change your password, [soonish] change your language, API settings, and export your data from Habit. Overall, HabitRPG is an effective way of keeping track of your habits. The game aspect of it has greatly (read: HUGELY) expanded over the last two months. 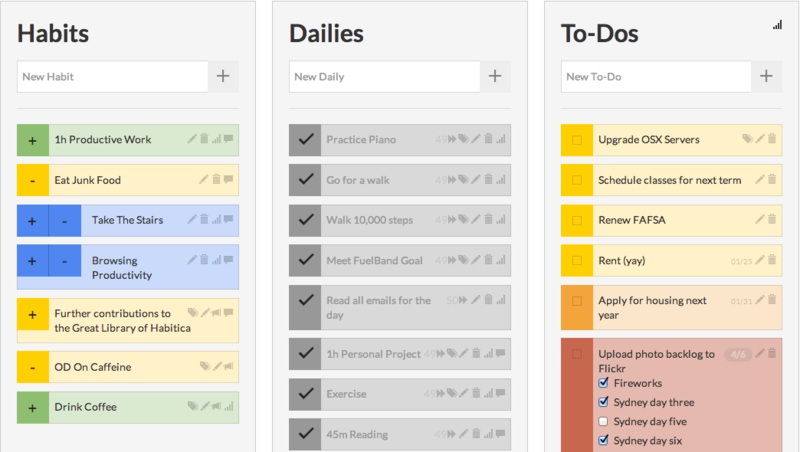 It’s become a very fun, and rather challenging way to keep track of your habits and to-dos. If you made New Years resolutions, HabitRPG will make sure you’re actually meeting them. It’s free (with the exception of Gems) to play in any modern browser and also has mobile apps for Android and iOS. 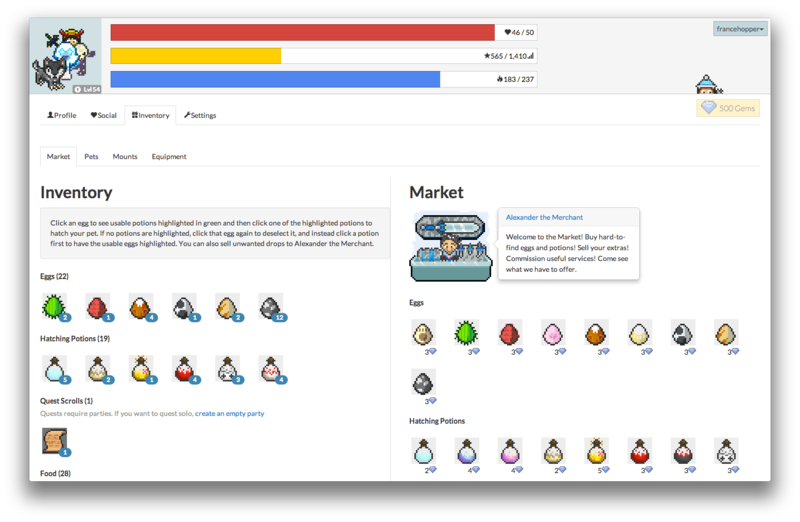 The “stable” version of HabitRPG can be found here and the “beta” here. Your data is synced across both versions. 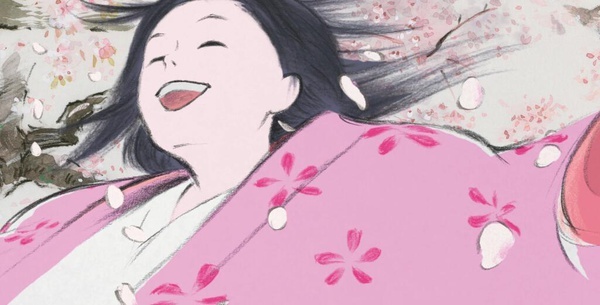 If you have any interest in the events of World War II, “In This Corner of the World” is a title I’d highly recommend, both the movie and the manga. 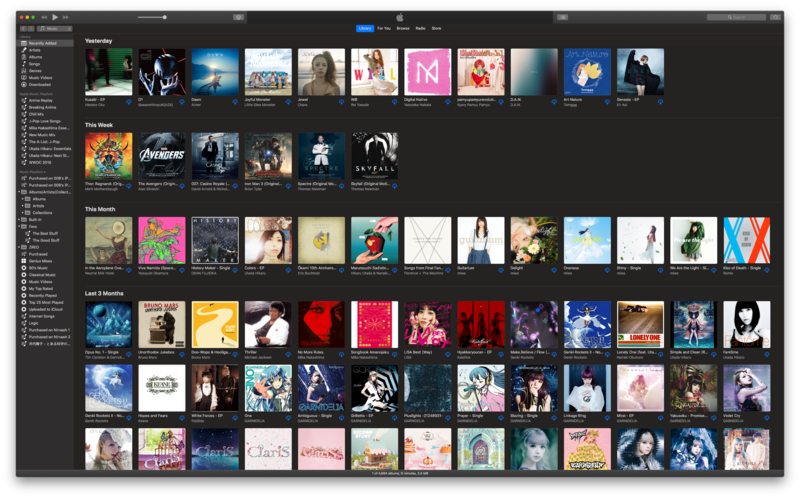 I didn’t think I’d ever subscribe to a music streaming service, but Apple Music managed to win me over. 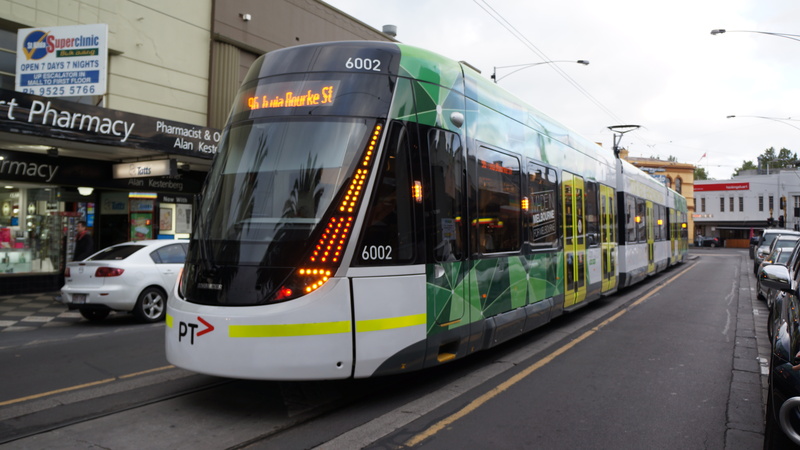 Next post Live in Melbourne? February Will Be A Good Month For Anime.